Parents contemplating a move from Montreal to Toronto should prepare to add a zero to the end of their monthly child-care bills, a new study has found. Released Thursday by the Canadian Centre for Policy Alternatives (CCPA), the report says the cost of infant care in Toronto is nearly 10 times that of Montreal, where Quebec's universal child-care program has been in place since 1997. The median monthly cost in Toronto is $1,675 vs. $175 in Montreal, making the two cities the most and least expensive in Canada, respectively. Since 2017, child-care costs have risen faster than inflation in 61 per cent of Canadian cities, the report found. Wait lists are still common in almost all Canadian cities. Parents are even known to place their unborn children on daycare wait lists before they've even shared the news with the grandparents-in-waiting. While some provinces made strides toward lower fees in 2018, those changes were overshadowed by the fact that fees remain "astronomical" in most cities, the CCPA said in a statement. The fifth annual report reflects some "really interesting new changes with several important provincial initiatives backed, to some degree, by federal money," said co-author David Macdonald, senior economist at the CCPA. "That being said, some of the common complaints for parents in most provinces remain, which is that child care is expensive, and that fees often going up faster than the rate of inflation," Macdonald told CBC News. "These fees can be incredibly high — $1,000 a month for preschoolers is not an uncommon cost. This single expense is often the second biggest expense for parents after rent or mortgage." Through 10,000 telephone surveys conducted with regulated child-care agencies in 28 cities over four months each year, the survey reports on costs of care for three age groups: infants, toddlers and preschoolers. 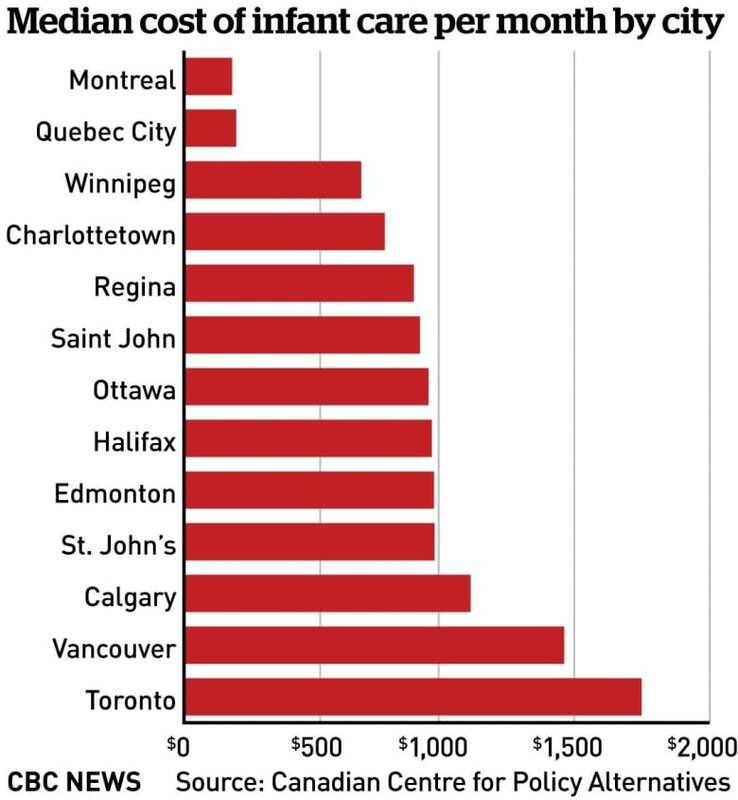 No matter the age group, fees were lowest in Quebec cities, coming in under $200 a month. These were followed by cities in Manitoba and Prince Edward Island, which have also had set-fee child-care programs in place for years. Parents in Winnipeg can expect to pay around $651 a month for infant care, while those in Charlottetown fork out a little more at $738. Three new provinces introduced measures to lower child-care costs in 2018 — Newfoundland and Labrador, Alberta and B.C. The Newfoundland program is furthest along in its implementation, says Macdonald, with about half the centres in St. John's converted to a new set-fee system. Alberta piloted a new $25 per day system in Calgary and Edmonton. B.C. 's initiatives are not reflected in the data because they were only just getting underway during CCPA's survey period. They include a $10 a day "prototype" program at 53 sites, across the board fee reductions at all licensed child-care centres of up to $350 a month, and a universal income-tested subsidy that applies to families with earnings up to $111,000 a year, says Sharon Gregson, a spokesperson for the Coalition of Child Care Advocates of B.C., which campaigned for the $10 a day program. The market has failed child care for the last number of decades. - Sharon Gregson , Coalition of Child Care Advocates of B.C. 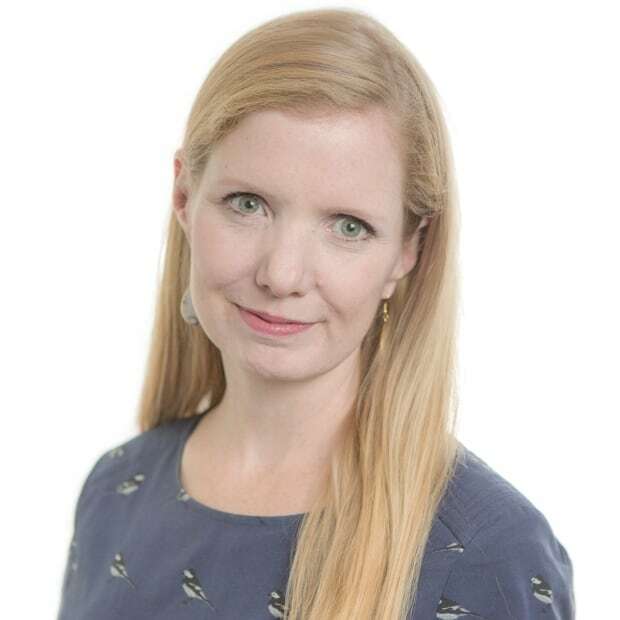 In Squamish, B.C., mom of two Laura Merriam says her four-year-old daughter's daycare was selected as one of the prototype sites for that $10 per day program. "After paying $60 per day for two kids for many years, it's been a huge relief to my stretched budget now paying $800 per month less than I was for her quality care," she said. Her daughter Sadie will start kindergarten this fall, so the relief will be short-lived, as pricey before-and-after school care will be in the mix then. "But even in the few months I've enjoyed it so far it has allowed me to pay off debt, save for a vacation, and contribute to the kids' RESPs," said Merriam. That's the kind of help Toronto mom Karen Levia and her husband would love. They're currently paying $1,400 each month for three-year-old Nicolas's daycare. They've put off major purchases like a kitchen renovation and replacing an aging car, but asked what they'd do with the extra cash if they paid only a low set fee for their son's care, Levia is clear: "Put it toward our equally ridiculously high Toronto mortgage." 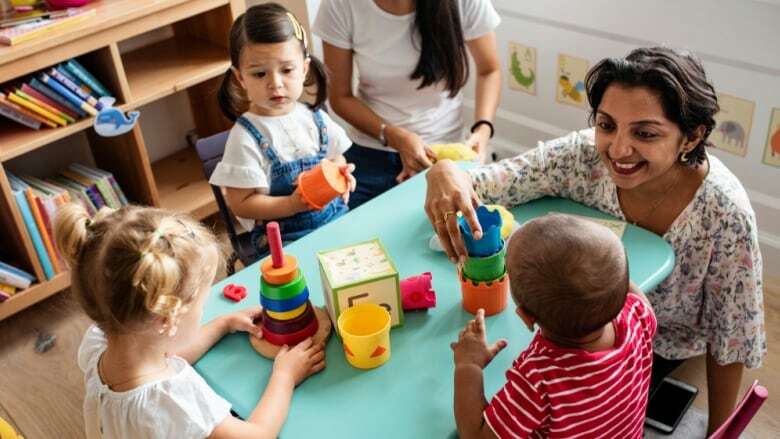 Child-care advocate Sharon Gregson, herself a mother of four, says the wide spread in daycare fees across the country shows that both the federal government and the provinces need to "step up." "When we look at the impact of women's work and the taxes that they pay provincially and federally, it is only fair — not just the right thing to do, but the smart thing to do — for provinces and the federal government to invest in quality, affordable child care and not leaving child care to market forces. Because, frankly, the market has failed child care for the last number of decades."